Both bonnets shown have ties attached at corners, not threaded through the eyelet row. Cast on 46 sts loosely, leaving a 3 foot tail (for tie later). Finishing: Sew end of yarn on each side to the center corner of where the ribbing edge and the scalloped edge meet. (You should have a tail end on each side of bonnet-one from casting on, one from casting off.) Secure yarn into this corner with a few stitches, then use this tail to crochet a chain for ties on each side. Or, if you prefer to weave a tie into the eyelet row done after the scalloped edge, just weave in your ends, and then single crochet a chain about 30" long (or use a ribbon), and thread through eyelet row. Either method works fine, but if you do it the first way, it is easier to flip the scalloped edge back if you choose, since the tie isn�t running through it. 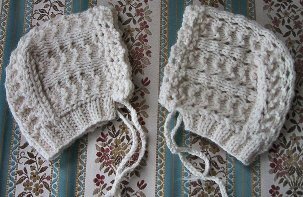 Note: For warmer and less lacy look (more �boyish�), simply twist the yarn over increases when you purl them on the next row after making them in the pattern row. Do this by purling into the back of the yarn over stitch when you come to each yarn over loop over the needle. This will make it snug up, and not have as much open lace to the fabric. But note, this will also tighten the gauge a bit, so the bonnet will be a bit smaller. Example is shown on bonnet on the left side of picture above.